I've mentioned before my quest to create the perfect carry-on travel bag, after not being able to purchase one that fits my exacting needs. Simplicity 4535 is as close as I've come so far, and it's pretty close! Most U.S. airlines define the maximum size carry-on as 35 linear inches. The dimensions of View D total 33 linear inches, so I went with this tote. 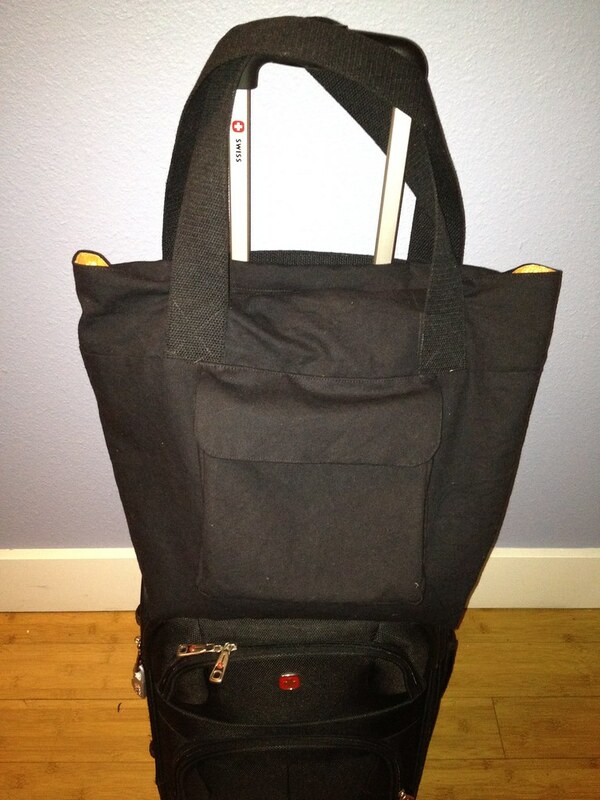 It's bigger than it appears in the photo because the bag has 7 inches depth. And as always, it's those little customized pockets and other details that really make or break the bag. The pattern instructions for View D stunk -- there were lots of references to following steps 3-5 for View C, or whatever -- but once you've made a few bags, the order of things just comes to you anyway. That's my code for "I didn't follow instructions much". I didn't interface the bag at all, because both self and lining are canvas, and because my last travel tote was interfaced and I hated it. I also used 2" wide cotton webbing for the straps, because that's how I like them! 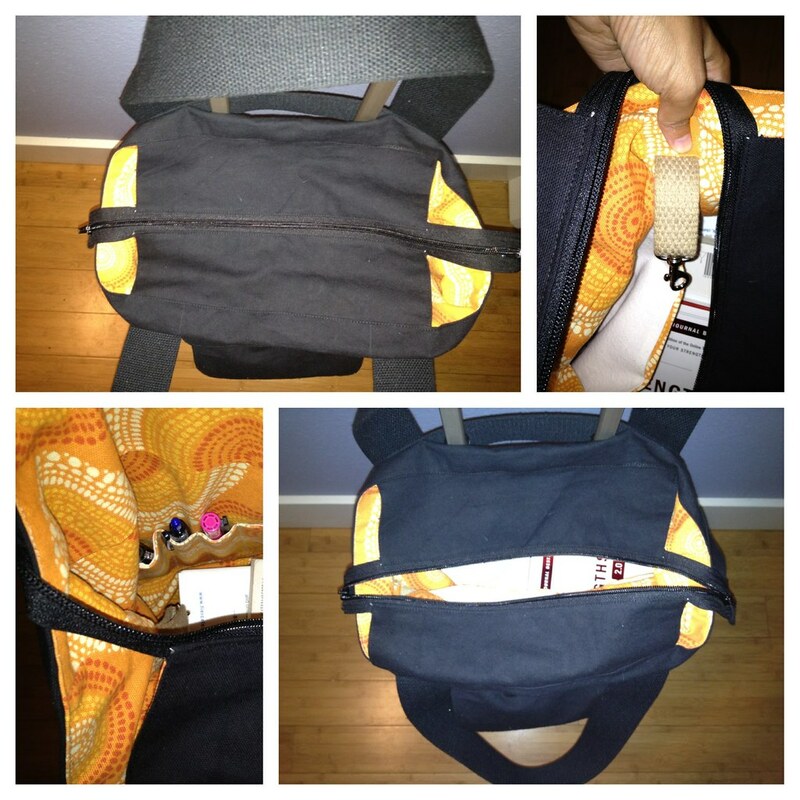 I added a secret pocket on the back, just below the custom strap that secures the travel bag to my roller board handle. The squared off zip top is something I copied from an Old Navy bag I saw recently. Didn't follow a tutorial, just improvised. The zip top covers most of the top, but not all, which makes it a little more versatile for pokey bits and odd-shaped bits and those times I don't want to mess with the contents of the bag to get everything to fit just so. You can also slide little bags of trail mix and other snacks in and out of the bag without having to zip open the top. Also, the zip top hangs about 3" off each end of the bag. This means that, when the zipper is open, the zipper opening is roughly the same as the bag opening. No squeezing things into a huge bag through a small zippered opening. There's a "key keeper" sewn into the lining, which is just a spring hook on a small piece of cotton webbing. When I leave the house, I tuck my keys in a safe place until I return home. Problem is that sometimes I don't remember where that safe place is! So I clip my house keys on the key keeper and forget about them until I walk back up to the front door, days later. Inside, I used the pen pouch pocket that came with the pattern, and next to that I added a small sticky-note pocket cause I never leave home without the sticky notes. I also made one huge pocket piece for the other side and sectioned it off into one big catch-all pocket, and a slender boarding-pass-sized pocket. Here's a better photo of the inside than the lower-left blip in the collage above. In the end, this is a bag that will get a lot of air time. The pockets are pretty much everything I need to support the flow of stuff I need to travel, and the size is just about right. I just got a new laptop and, in its entirely badass laptop sleeve (which I did not sew -- was a gift), it's a bit tall for the bag. The bag gives, ultimately, but I could have measured and added what I needed to the length of the bag. I'd also love to have known that the straps are just a touch short for me. I'd add a few inches to each strap next time (if there is a next time). I like that bag. I hate it when the zippered opening is much smaller than the bag itself. How did you come to the 3"? Hey there. The two-way purse zippers only come in two standard sizes at my local fabric store. I chose the smaller of the two, which is 18". Given the dimensions of this bag, when I centered the zipper on the 12" opening, it left a 3" hang on each side of the opening. I had an Old Navy bag that had a similar feature and I really liked that, so I used the concept and what I guessed the construction process was.